Working in this field with developmentally disabled individuals, one thing we have seen over and over is a strong dislike for showers. This is not true for all, as we did have a few in the old group home who loved showers. Then we had those, not unlike Joshua, who hated them until they were in one and then wouldn't get out until the hot water ran out. But for the most part, the individuals with whom we work would never shower if the choice were completely left up to them. The two guys we work with now fall into that category. There are certain tricks to getting these guys in the shower. One guy will shower with a little bribery - oops, I mean intermittent praise and rewards for doing what is asked. The other will shower when he is getting to go somewhere that he wants to go. So this morning, we are all trying our best to get some showers going. And, we are being very unsuccessful. Lowell goes upstairs to try to convince Camelot to shower, but he immediately comes back down and says, "There's no way I would shower in that bathroom either." So that it doesn't look like we have completely neglected the cleanliness of the upstairs, I need to say that this bathroom was nowhere near this state just last week. He has been living on his own upstairs for the past month and is relatively independent. He assured us on Friday that he had cleaned it, we glanced at it, and it wasn't too bad. This mess happened fast!!!! Even though we both knew better, Lowell convinced me to go upstairs with him, just to have an extra eye witness in case someone died while cleaning. Nasty doesn't even begin to describe the sight I saw, and I won't begin to go into it in case anyone reading has a gag reflex like mine. This was definitely a job for Lowell. He went back over to our side of the house and re-emerged a few minutes later ready for combat. He had on his gloves, his old clothes, and his Vicks® VapoRub® ointment. He walks by and the scent immediately takes me back to the days when I was too sick to go to scho ol and stayed with grandma. 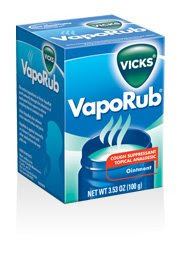 Vicks website proudly proclaims that the VapoRub is the #1-selling product for ages 2 and up in the cold category. What they don't tell you is that it also will keep you from gagging if you are cleaning a disgusting bathroom, or any other smelly job. Just slather a little from the tip of your nose to the top of your lip and it works miracles. I did worry a little about what would happen if Lowell died in there. I sure wasn't going to go in for him. I thought about tying a rope to his ankles like the ancient priests did before they went into the Holy Place so I could just pull him out in case something did happen. In the end, we decided against that and he just went for it. About two hours later, he emerged victorious. And unlike the other two men in the house, he didn't give me any trouble at all about taking a shower. As a matter of fact, I didn't even have to ask.